Others don't think your rude because they weren't offended by it. Or alternatively perhaps they don't think I was being rude because it was in no way a personal attack on you? Your inability to distinguish between arguments and yourself is worrying. Uro described it best - just because something is negative does not mean it is rude when it is used in a purely descriptive way. I consider the use of the word "preposterous" to be entirely descriptive of the so-far unsupported claim that people 4000 years ago could live for 900 years; it is in no way a personal attack upon you despite your continued attempts to personalise the debate and perpetuate this logical fallacy. I'm not appealing to pity who the hell would i be appealing to?. A hypothetical observer, perhaps? I'm not a telepath, I don't understand the reasoning for your fallacious behaviour. Wow, Gorman, that makes no sense to me at all. And completely goes against everything I read in Time Enough For Love (which, while sci fi, does have some really curious views of families, and taboo). I ask myself why bother saying anything but I can't stand by and say nothing. I know reporting this will do good, but with no other mods around besides KS, no offense KS, it's useless to as LadyM or Ovi will lock it, and we don't want that. This thead can take far more than a bit of whining. Don't worry, there's no need to get lock-happy over something so trivial. There's no flaming or personal attacks going on. But honestly it's useless to continue this pointless argument don't you think? Yes, that's what I said earlier. Distracting from the actual debate is at best poor reasoning and at worst deliberately intellectually dishonest. Oh, I guess with all the panic I've overlooked some of your posts. Now I see it, than this charade is over with; moving on people! No offense of course but it go's against everything you read in Science fiction?. Does that really matter or did i miss something?. One work of fiction's word against another's. Now your just trying to kite me in to getting modded and you know it. 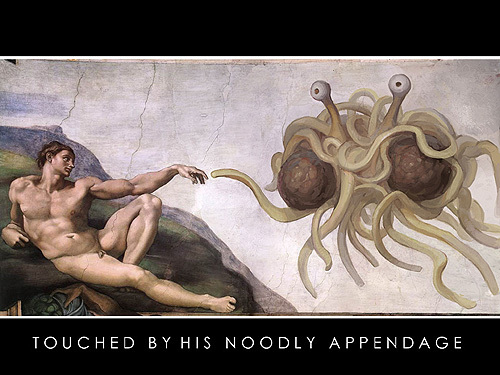 All hail the Flying Spagetti Monster! Did it ever occur to you that you don't even have to look at this thread, let alone post in it? Are you that bothered by having your beliefs questioned that you have to respond to every comment that even vaguely contradicts them, even when its not what's being debated? Now if you'll excuse me, we're supposed to be discussing evolution. The presence of Homologus (probably didn't spell it right) structures in tandem with the fossil record and the laws of genetics provides ample evidence of evolution. I have no idea what you just meant by that. Care to translate? I'm not an Evolutionist, but I still love Spore. Its not the Evolution I like, I like the artist in the box. Sumgi hasn't been here since August of 2006, bet he'd be surprised at big this thread has gotten and the content within. but maybe you should read who starts most of them. This is not the religion thread its the evolution thread. But it seems most of the people here (yes the none creationists) cant discuss evolution for long with out tearing apart religion which actually could coexist with evolution. Then if a creationists steps in to defend his view thats being picked apart with no opposition it somehow becomes his fault? If you don't believe me read more then a few pages back. Your just trying to get me to lose my temper and attack you so a mod has to yell at me. I want to quote something by the way. And it applys to to tact discussion we has as well. 1. Be respectful of others at all times. The purpose of the forum is to provide a platform for the exchange of ideas. Occasionally, there will be conflicts that arise when people voice opinions. Be courteous when disagreeing with others. It is possible to disagree without being insulting. If someone disagrees with you, remember to respect their right to their own opinion. This works both ways. Don't be forceful or rude when expressing your opinion. Obscene or sexual references will not be tolerated. This forum is family friendly. If you want to talk with a filthy mouth, do it somewhere else. Now Gorman let's not get too defensive. I think it's best we all go outside and cool off.